What is a Safe T Home®? Schedule a presentation: Email SafeTHome@Sukup.com to inquire about having a representative from Sukup Manufacturing visit your organization or meeting to share the Safe T Home® story. Provide a Safe T Home®: Looking for an alternate holiday gift or company-wide support project? Consider providing a Safe T Home®! We can even engrave the home with your company or organization’s name or logo and let you know where it is providing a safe shelter for those in need. See a Safe T Home® for Yourself! : Check out the Events where we will have an actual Safe T Home® constructed and you can go inside, see the design, and feel how the home is naturally cooled. 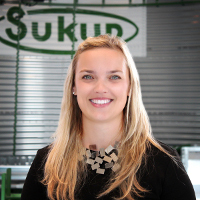 Emily Schmitt is in the third generation of family active in Sukup Manufacturing Co., the largest family-owned, full-line grain drying and storage equipment manufacturer in the country. She serves as General Counsel for the company, which employs more than 600. Emily earned a bachelor’s degree in business management from Iowa State University in 2008, and went on to earn a Juris Doctorate from the University of Iowa College of Law with high honors in 2011. As general counsel, she manages a wide variety of legal issues including intellectual property, litigation, public policy, and human resources. Emily spends significant time promoting and speaking on the Sukup Safe T Home®, a hurricane-proof home the company manufactures and has placed nearly 300 homes in Haiti (www.SafeTHome.com). She also serves on numerous boards of directors at the local and state level. Emily and her husband Andy reside in Clear Lake, Iowa, with their two daughters. © Sukup Manufacturing Co. 2019 All Rights Reserved. Powered by Sukup Manufacturing.